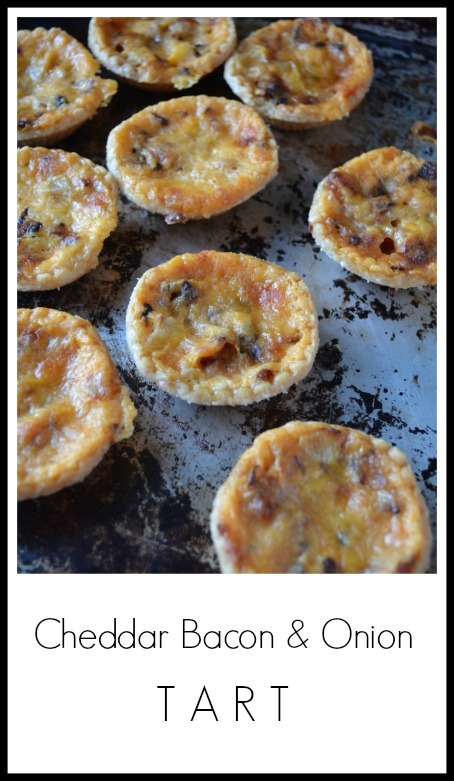 Not only I am sharing this delicious recipe for savory tarts today, I am also hosting not one, but two giveaways thanks to the good folks at Gay Lea! But first a little story and a delicious recipe! As an ambassador for Gay Lea I have been giving a lot of thought about the farming industry, dairy farmers in particular! I am no stranger to spending time on a farm, but when I failed miserably at trying to milk a cow I got to move on to more fun farm activities like jumping from the loft into piles of hay! And, I lived to tell about it. Looking back now I am not sure it was a such a great idea. 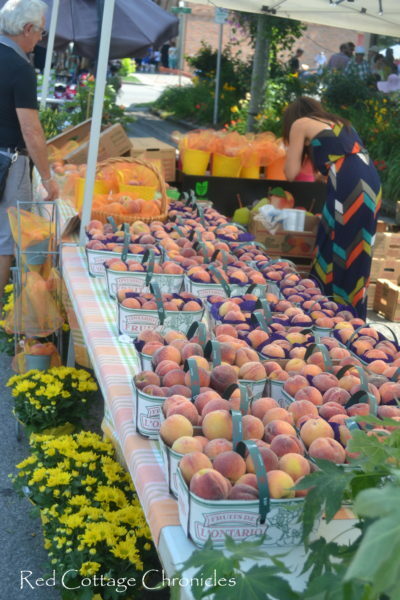 I spent many summers on my cousins farm in Dunnville, Ontario and know just how hard farmers work. The family (kids included) and farmhands were up before dawn getting to work a the very long list of daily chores. Once my cousins chores were done, us kids got on with the business of having fun on the farm while the adults were busy well into the evening. 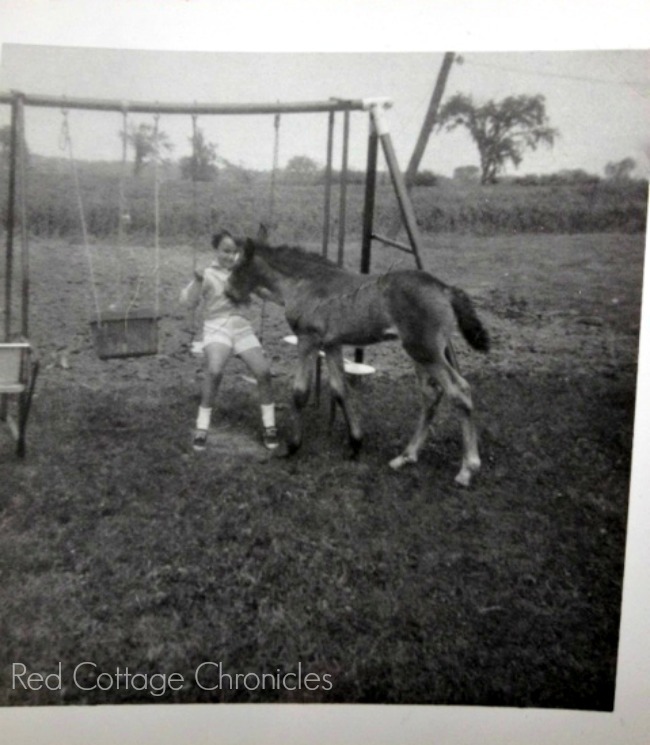 We would ride the bales of hay up the conveyor to the barn loft, take the peddle boats out onto the huge pond, and sometimes we would get a wagon ride way out to the back pastures to check on the horses. I loved being around the animals. The horses were beautiful and so big to this little city girl. 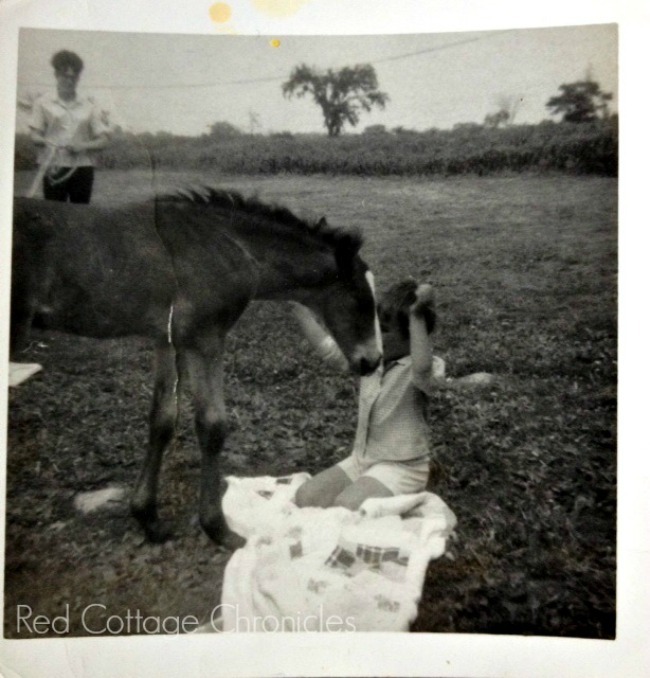 I got to see colts right after they were born, one very ornery goose who chased my mom whenever she got to close, and checking the chicken coups for eggs every day was a favourite! Did you know that if you chew a handful of wheat long enough it would turn into chewing gum? Just one of the many things I learned on the farm. The farm is where I learned to make butter by filling mason jars with cream skimmed off the milk and shaking it until our arms would fall off. It thickened into a creamy sweet butter! No matter how much fun I had on the farm, I am so grateful to all the local farmers who get up at the crack of dawn to milk those cows so I can bake things like these delicious Cheddar, Bacon & Onion tarts. When I am preparing a recipe where cheese is the key ingredient, I always make sure to buy the best quality, and usually choose a sharp aged cheddar to ensure the richest flavour. Ivanhoe’s line of quality cheeses is a favourite. The oldest cheese company of its kind in Canada, they have been producing award winning cheeses since 1870! Still in the little town of Ivanhoe, Ontario, they have a factory store where you can experience the art of fine cheese making. 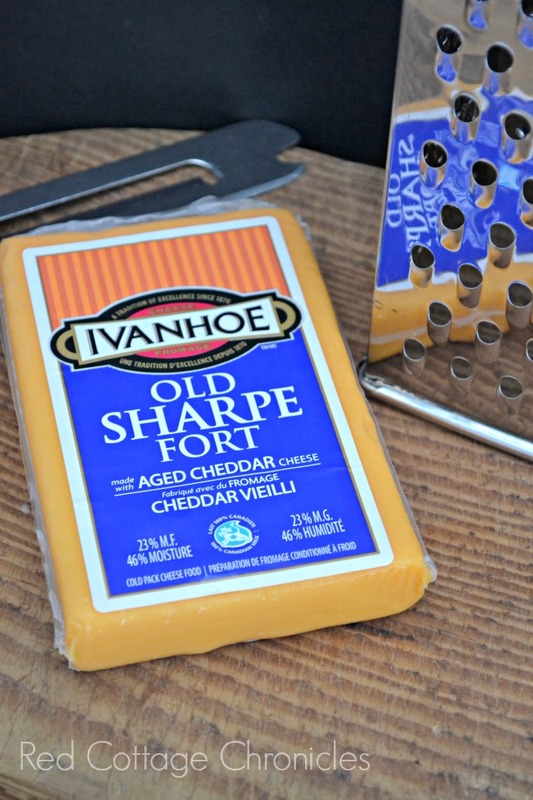 You can read more about the Ivanhoe experience and their cheeses here. 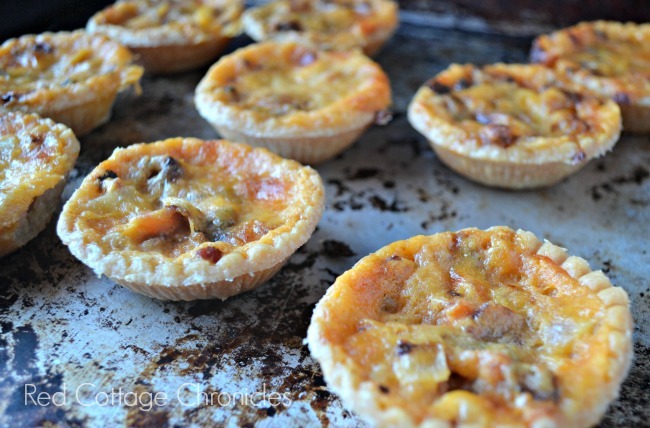 Their Old Sharpe cheddar is so rich and creamy it really is the star of these savory tarts that are just as delicious cold as they are hot from the oven making them the perfect thing to serve as an appetizer, pack for a picnic or as compliment to a cheese tray. Now on to those giveaways! Courtesy of Gay Lea, I will award one lucky winner from Red Cottage Chronicles with 12 coupons for free Gay Lea products. That is a whole year of Gay Lea! A random winner will be chosen at the close of the contest, April 30th, 2016. As a Grand Prize, Gay Lea will award one lucky winner from all entries received from Gay Lea Ambassadors across Canada, a Kitchen Aid Stand Mixer! (May not be exactly as shown – approx retailer value $450). Gay Lea will choose a winner. Winner(s) can expect their prize in approximately 4-6 weeks! A delicious savory tart perfect for any occasion. Arrange tart shells on a baking sheet, prick the bottom of each with a fork and bake at 450 degrees for 8 minutes. Remove from oven and set aside. Meanwhile, in a large skillet cook bacon until crispy; drain and divide evenly between the prepared tarts. Melt 1 tbsp butter in the same pan and cook onions until golden, about 5 minutes. In a large mixing bowl combine the cheese, cream and cooked onions; divide evenly spooning over the bacon crumbles in each tart shell. Return tarts to oven and bake for 22 minutes at 350 degrees. Wow I just checked and Ivanhoe has Horseradish White Chedder. The wheels are turning. Great recipe, I’ve got to find decent gluten-free pastry for them! The breakfasts. Waffles every Christmas morning. Egg Salad sandwiches every Easter. Little things that add up to shared traditions. Yum! These look delicious. In fact, I’d add that old saying, “Bet you can’t eat just one!” I’m sure these only go down the hatch in multiples. The recipe only calls for items regularly found in my fridge, other than the tart shells and they’re easy enough to pick up. I actually read through the recipe twice to check for an egg. No egg required? Thanks Maureen! I’ll definitely try these out. Yum! 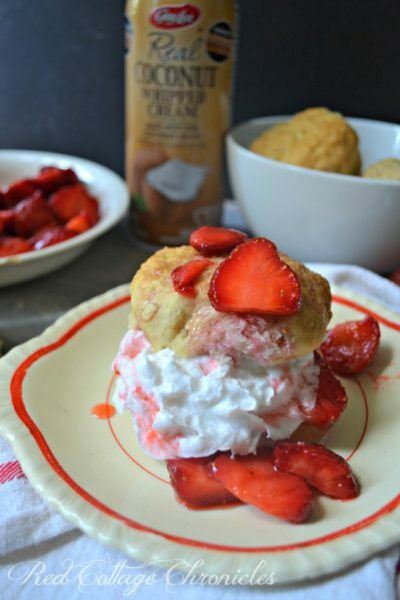 This recipe looks so good – will have to try it! I love a good, rich, old cheddar too! 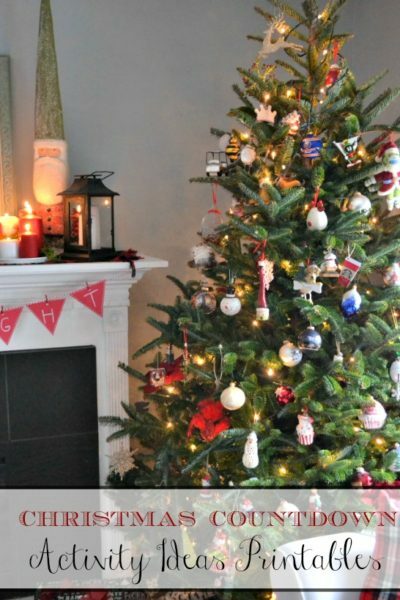 The Giveaway Tools form asks for my fav holiday tradition – opening stockings on xmas eve! Favourite holiday tradition is going on the Christmas train for my daughter’s birthday! These look delicious! My favorite holiday tradition is a new(er) one. 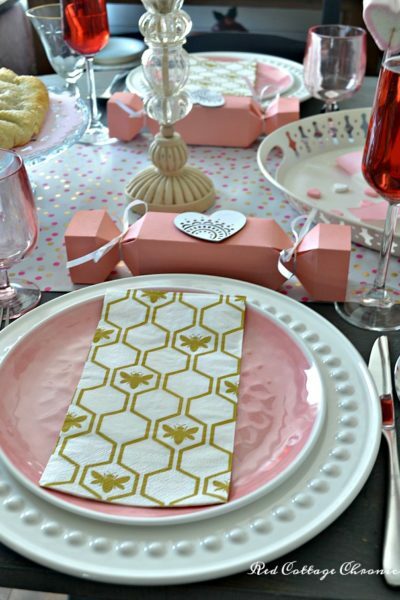 We host an Easter open house for our family and friends and we have the best time doing it! My favorite holiday tradition is baking cookies for Santa with the kids. The kids and I used to always make a whole bunch of cookies for Christmas. My favourite family tradition is every Christmas morning making cinnamon rolls for breakfast, they are so good to eat while opening gifts!! 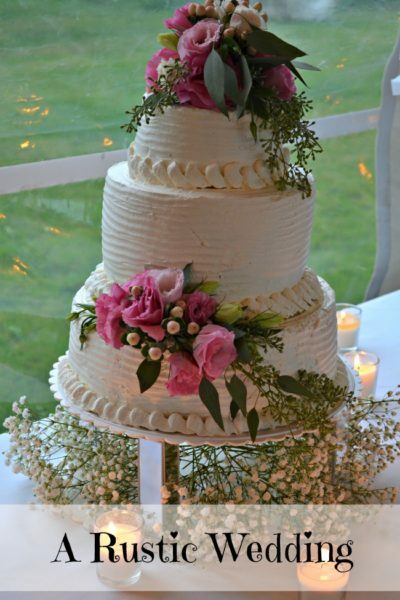 I love to bake pies and cakes. My favorite holiday tradition is getting together with family for some baking. My fave holiday tradition is the 12 meatless dishes we have on Christmas Eve. I love to bake banana bread and muffins! My favourite holiday tradition is church followed by my sister’s on Christmas Eve. Our favourite holiday tradition is having a nice dinner Christmas Eve & exchanging gifts..
My favourite holiday tradition is get together an all the food! My favourite holiday tradition is eating together and playing games. My favourite Holiday Tradition is making Tourtière with my mom. These looks delicious, Maureen!!! I make a similar recipe, but in a large galette shape. I’m pinning these to refer to when making appetizers for a fund raising event I’m coordinating. Happy spring weekend!! My favorite way to cook with cheese is to make lasagna. I love using cheese with pasta! I love to make cheese straws, and homemade macaroni and cheese is wonderful. i enjoy making homemade pizza topped with lots and lots of cheese! my favourite thing to bake are peanut butter cookies! I refreshed the page and the question has changed?! O well, this one is even easier – I bake with cheese a lot – twice baked potato, cheese sticks and a million more cheese recipes that I have. fabulous ways to cook with cheese ,,,pizza,,, pasta,,,,yummmmmzzzzz. My favorite thing to mix up and bake is a strawberry shortcake!! 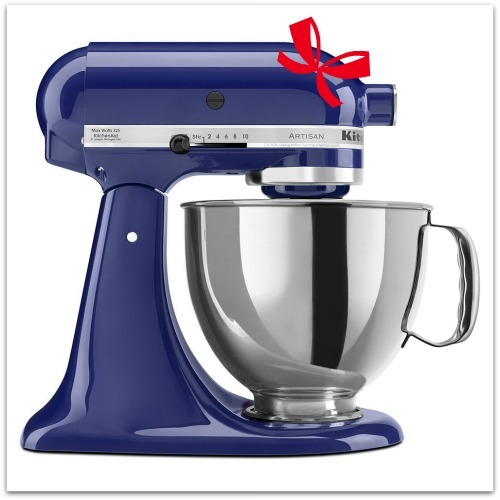 I whave my fingers crossed to win a KitchenAid Stand Mixer! My favourite way to cook with cheese is making homemade pizza,i just love it so much ! I like to have it grilled on toast! My favourite is mac and cheese, lots of cheese. Carrot cake is my favorite thing to bake. My favorite way to bake with cheese is putting it on chicken breast mixed with mayo. On my homemade pizza…lasagna is a close second! Love ooey gooey stringy cheesy mozzarella! cheese omelettes are always a family favorite! My fave is 3 cheese lasagna. I love making garlic shrimp with melted cheese on top had it at a restaurant and have been making it at home ever since. I love baking cookies. Any kind ! I love making twice baked potato. My favourite thing to bake is chocolate cake. I love Cooking Lasagna with cheese. Kids love Mac and cheese. I love baking cheese into pastas. I love a great grilled cheese sandwich. Love using old cheddar in my homemade cheddar and onion bread!! My favorite thing to make with cheese is FONDUE! I love how the cheese becomes the central masterpiece of this social meal, everyone gathered around dipping veggies, french bread & other delights into the smooth bubbling cheese! I love cheese in pasta salads! I like plain’ old grilled cheese. I love cheese in everything. I don’t use it much in baking because I’m cheap. I use it in eggs, in salad just to name a few places. I love to make my eldest sons favourite cheese dish – Homemade Macaroni and Cheese! Cheese fondue is great for when you have guests over!! I like a good cheesy pizza. I like using cheese in baked pasta dishes, like lasagna or baked ravioli. I love using cheese on pizza & french onion soup. I love to bake cookies! YUMMM! I love to add cheese to pastas. I love baking enchiladas, smothered with cheese and cumin. I love melting cheese dishes like pasta but I also love cheese in salads. Cheese and more cheese on nachos! My favorite dish to bake with cheese is shrimp and bacon lasagna rolls. Oh my! My daughter would love these! I love to bake with cheese, like as in biscuits. Farmers don’t get the love that they deserve and that’s a shame. Thank you for the stories, the pictures and the tarts are amazing! I love to bake cheese sticks – mostly cheese and spicy. I love homemade Mozza sticks. I don’t make them very often though. I like to cook with cheese in omelettes, casseroles, sauces, lasagna, cannelloni, & grilled cheese. grilled cheese is always a good one to make! Another thing I love is a cheese and onion pie, hmm delicious. My favorite way to cook with cheese is mac and cheese. I use 3 different kinds of cheese ! My favorite things to bake are brownies and cookies. Always good for the lunch box!! I love making broccoli or cauliflower soup! I enjoy cheese in my omelettes Thanks! I like a good cheese biscuit. I like cheese in scalloped potatoes. I like cheese in biscuits! Macaroni and Cheese is a favourite! I love to add cheese to my salads. I love making a chocolate cake truffle with Snickers, Chocolate Pudding and Whipped Cream. I love melted cheese on anything. My favourite way to cook with cheese is to make extra cheesy quiches. I love melted cheese, grilled cheese sandwiches, potato gratin, shredded cheese added to mashed potatoes, lots of cheese on a pizza, cheese scones. I do however also love cheese on crackers too and in my salads. I love to bake zucchini banana bread. It’s my specialty ! Cheddar cheese crackers are the bomb, and I like to make my own cheese bowls!! My favourite way to cook with cheese is as a melted topping for frittatas, tuna melts, enchiladas. Cheese pizza is always a hit here! I LOVE to bake shortbread! My favourite thing to bake is my Gluten Free Bread, cheesy onion bread! I’m GF so I bake a lot of my own breads and desserts. It’s a lot of work with the mixing and timing but so worth it. A Kitchen Aid would make my life so much easier and I would probably bake more often! Me too! 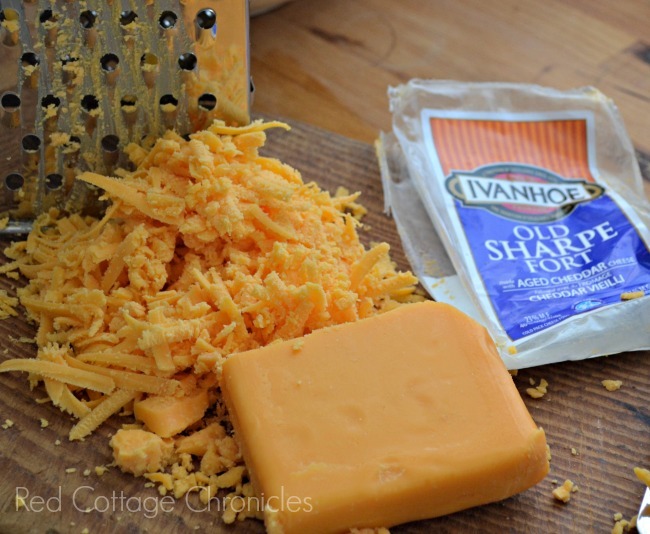 In fact that is exactly what I do with this Ivanhoe Cheddar when I am not cooking with it! My favourite thing to bake is cookies with my son!! My favourite way to cook with cheese is to make lasagna!! Macaroni and cheese is always delicious! I enjoy using many different cheeses in my lasagna, brings so much flavour! Mac and cheese is definitely one of the top of my list! We love a really good Grilled Cheese sandwich! I love cheese and onion bread. I like cheese sprinkled on a casserole. I put cheese on top of a lot of things, baking or not. I like to make cheese quesadillas. Quesadillas are always a hit with cheese! I like to make the garlic toast into cheese toast !! I like making cheesy breads and buns. love cheese baked with pasta! Parmesan cheese on pasta, a staple here…..
Love Grilled cheese sandwiches ! I like a nice cheesy omelette. My favourite way to use cheese in recipes is melted in one way or another: lasagna, French onion soup, in mash, grilled cheese sandwich etc etc. I love baking breads, buns and scones with cheese. They are delicious and they go with just about everything!! Whether I shred it, slice it, dice it, sprinkle it….every meal is tastier with cheese. I love adding and mixing different blends in my homemade macaroni. Thank you and good luck all! I love to make grilled cheese sandwiches with different types of cheeses! I put cheese on top of a lot of things, baking or not! My absolute favorite way is to make the cheese into a fondue! A family tradition since before I was born! I love cheesy breakfast scones! cheesy baked potatoes are are a staple. My favorite way to cook with cheese is with lots of it! I love it in baked pasta dishes. Our family loves it in a fondue! Another great way is baked in and on top of a chicken & rice casserole. I like it on a homemade cheesy pizza. I like making a good cheese pizza. Cheese can be added to anything but I love adding it to my eggs. I love to add cheese on top of homemade onion soup! I love a nice homemade cheese cracker. pizza with extra cheese….yes please! In a fondue is my favorite. Another awesome way I enjoy is Four-cheese macaroni with bacon! I love adding cheese to many dishes, lasagna, salad, burgers, my favourite is baked brie! My favourite way to cook with cheese is lasagna, omelettes, marinara sauces and grilled cheese. mac and cheese is a classic and so good. There are so many things that I like to make with cheese, usually in a melted form. I like making a whole cauliflower covered with ham and with cheese, sitting in a white sauce. In the oven it goes and it tastes fantastic. I love homemade deep fried cheese sticks. Twice backed potato is one of my favorites! Craving a grilled cheese sandwich this morning…. Fondue will always be my favorite way to cook with cheese. I also love making omelettes for breakfast or dinner, loaded up with meat, veggies & of course tons of cheese! I love to make super cheesy lasagna! I love using cheese in allot of my cooking, burgers, lasagna, salad, bruschetta, my all time favourite is baked brie..daughter got me hooked on it! I love to use cheese in my sauces, pasta, and grilled cheese sandwiches. Cheesecakes are a definite favourite. I love to use cheese in a melted form as in potatoes gratin, grilled cheese sandwiches, cheese and onion pie, pizza, French onion soup, omelettes, cheese scones, cheese bread rolls, cheese fondue etc. I love to shred cheese on top of all kinds of things like scrambled eggs, or pasta. Twice backed potato is one of my favorites. I like to make cheese and onion bread. Fondue is #1 for me, always has & always will! Another way I like it is baked in a cannelloni! cheese melted on just about anything is a hit! My fave is grilled cheese but the hubby loves adding cheese to most of our meals by sneaking it into the recipe one way or another. You won’t hear me complaining. Making a fresh onion soup! Thank you! I love a cheesy lasagna! Cheese is of course good on anything, but I like it in omelettes. I really like cheesy pizza. I love melting cheese on pitas – That’s what I gave my kids for breakfast this morning! I love making panini sandwiches with all kinds of cheese. Ham & cheese biscuits are tasty! I love cheese in pasta dishes like lasagna! Fondue is amazing cheesy goodness & is my #1 fave. Another way I love cheese is in a frittata! MMMM cheese! We use cheese in quesadillas, lasagna, scrambled eggs or in stuffed jalapeno peppers. and then there is Chicken Breasts sttuffed with broc and cheese… oh and noodles those long thing things…cannolli? I love cheese on eggs or pasta. My favorite way to cook with cheese is making my yummy lasagna. Yum! I love cheese in salads, making grilled cheese sandwiches and in pasta dishes as a topping. I like garlic cheese toast! My favourite way to cook with cheese is making macaroni and cheese. Grilled cheese sandwiches all the way! We had tacos for dinner yesterday…..loaded with cheese!!!! I am cheese fondue’s number one fan! Another way I love cheese is on special occasions we make hot cheesy bacon garlic dip in a bread bowl, it’s amazing! I like a homemade cheesy lasagna. I love using cheese in my cooking whether it’s in mashed potatoes, on a pizza, on top of French onion soup or in cheese scones. Cheese adds a wonderful flavour to practically everything. 🙂 I add cheese a lot. so excited to have won, and looking forward to those coupons! !